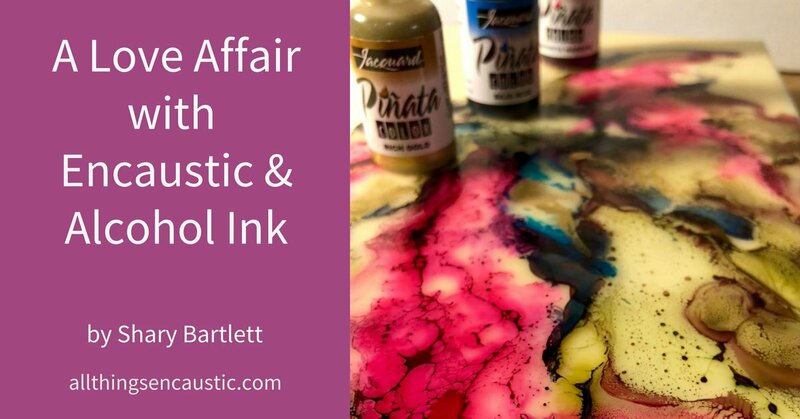 Disclosure: Jacquard Products sent me a complimentary set of their Pinata alcohol inks to review as part of this article. I have to tell you a secret. I’ve been having a serious encaustic love affair lately – with alcohol inks. The two of us were introduced years ago, but we didn’t start dating until early this year. I didn’t want anything to mar my devotion to encaustic, so I got to know alcohol inks first on Yupo paper. What was the personality of this medium? What if I sprayed it with water when dry, or when wet? What if I spiced things up a bit with a dash of salt? What if I dropped ink into a pool of Isopropyl alcohol? I was immediately smitten. Alcohol inks come in a variety of colours – some are handsomely bright, like Jacquard’s Pinata inks. Some are the more natural, outdoorsy type – like Tim Holtz’ Adirondack Inks. Some, like Copic pen refills, are subtle and discreet. Right from the beginning, I loved their spontaneity. I’d make a mark on the page and the ink would react. I’d respond to that effect and the ink would do something else. If I passed a hair dryer successively over wet ink, gentle, wave-like lines would appear. But passion can get hot! If I got too close, the paper would start to melt. It was like we couldn’t stop having these amazing conversations. Soon it was time to take things to the next level: encaustic! I prepared a smooth wax surface on a wood substrate and tried to invite the same intoxicating waltz. Well, it turns out that wax is not the same dance partner, so I had to adapt my techniques. We still hit it off though. Of course, wax is much more tolerant of the heat. I could torch the inky surface to an almost boiling point to get effects that mimicked the lacy look of pigmented shellac on encaustic. Carving into the wax allowed wet ink to run into the wells. I sprayed wet ink with water and let it dry, learning how to fuse carefully and successively so that the ink didn’t move. But as with any love affair – reality finally started to set in. Flammable: One fateful night we got so carried away that I started a small fire on the wax surface. I learned never to fuse wet alcohol with a torch. Unsafe to breathe: Ignited Volatile Organic Compounds in alcohol inks are also very unsafe to breathe. Alcohol inks must be used in a well-ventilated environment and never applied airborne from a spray bottle. And finally, the fateful truth revealed itself: I learned that alcohol inks are not archival. Alcohol ink is dye-based – kinda like Kool-Aid cordial. Pigment is dissolved in Isopropyl (or Ethyl) alcohol and a binder; the granules become small and translucent. Very beautiful, but not always stable when exposed to light. We know art should never be displayed in a sunny location, but some ink colours are more lightfast than others. Jacquard informed me their Pinata alcohol inks contain the most lightfast dyes and ethanol alcohol, and the metallic and whites are made of true pigments. If alcohol inks are not archival, what, I bemoaned, was to come of my fabulous love affair? I’d been using black India Ink to introduce line into my encaustic/ink paintings and learned that Dr. Ph. Martin’s Bombay India inks are archival and lightfast. This is because India ink behaves more like chalk pigment suspended in water and gum/shellac. The particles remain larger than when dissolved in alcohol, remaining archival as such, and they rest more on the surface of the wax. India Ink tends to have more muted colours, but these can still be somewhat transparent, and I found they achieve a more pronounced cracking effect on wax when dried and fused. You can read more about India Ink and Encaustic here. So these many months later, you might wonder how my love affair is proceeding… While you might think I’d have forsaken alcohol inks for the more archival India inks, I truly love them both. I feel strongly that the art I sell must be archival, but when I’m experimenting for my own fun… why not play with a variety of materials? Indeed, many fine mixed media artworks would never have been created if artists didn’t experiment, right? Think of Picasso! Does wax provide UV Protection? Some artists have asked about the UV protective nature of wax. Wax seals the paper from the air but it is not a UV protectant so the inks can still fade. Personally, I’ve found that dyed fabric I included in artwork created years ago has faded over time, despite the protective wax surface. Others have inquired whether UV spray can be used on wax. I am loath to spray chemically-based sealants on encaustic. I found that a quick, thin layer of clear medium pulled across a well-fused ink/wax surface does encase the ink, but I don’t like the loss of translucently. If you’re wondering which ink colours are more lightfast, try painting experimental test grids and leave them in a sunny window to see which inks hold up over time. Such is the salacious story of my love affair with ink thus far. You might be tempted to try them and fall in love yourself… Get out and do some encaustic/ink speed dating! I invite you to leave a comment or question below about alcohol inks and encaustic painting. Thank you to the following for information: Bethany Handfield, Linda Roberston, Chartpak Inks, Jacquard Products and that great well of information…the internet. Join Shary for her upcoming Encaustic Mixed Media workshops, including Ink on Wax in Vancouver, Canada. Shary Bartlett is an artist and fine arts instructor living in Vancouver, Canada. 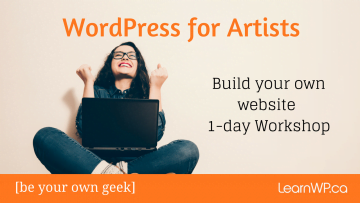 She teaches Fine Arts at Capilano University and Langara College and leads mixed media workshops and retreats in Canada, the United States and internationally. Her mixed media body of work includes encaustic, acrylic, fibre arts, prints, sculptural assemblage, collage and altered photographs. That sounds fun. Glad you enjoyed the post. You’ve inspired me to pull my alcohol inks out of storage, dust ’em off and give them another try. My love affair never really ignited…lol. Thanks for the post! I’m so glad that you mentioned alcohol ink isn’t archival; I had to quit using it in my encaustic as well. However, I love it to play with! Playing is great. And try the Dr. PH Martins for archival quality. See if that works for you. I have been using alcohol inks with encaustic wax. I use the AI first seal and then apply colored encaustic wax on top. Beautiful results. If you want to have fun, paint glazed tiles with alcohol ink and use a flame on them. They burn quickly and you have a whole different aspect on your tile! Wow. That sounds really fun, Gail. I tried that once without wax and I loved the super high gloss shine. Did you put Encaustic on yours? I suspect the wax would not adhere well to a glazed tile, however, Wax adheres beautifully to bisqued tiles. Great article Shary. I was especially interested in the archival-qualities of the various inks! Glad you enjoyed it, Janet.